For the origin of life, see Abiogenesis, Astrobiology, Biogenesis, and Panspermia. 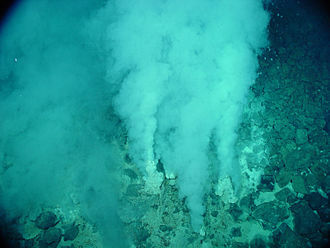 The earliest known life forms on Earth are putative fossilized microorganisms found in hydrothermal vent precipitates. The earliest time that life forms first appeared on Earth is unknown. They could have lived earlier than 3.77 billion years ago, possibly as early as 4.28 billion years ago, or nearly 4.5 billion years ago according to some; in any regards, not long after the oceans formed 4.41 billion years ago, and not long after the formation of the Earth 4.54 billion years ago. 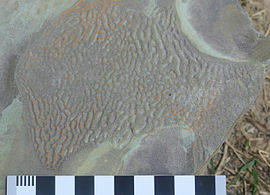 The earliest direct evidence of life on Earth are microfossils of microorganisms permineralized in 3.465-billion-year-old Australian Apex chert rocks. The Earth's biosphere can be considered sort of a shell around the earth, extending down to at least 19 km (12 mi) below the surface of the earth, and extending up to at least 64 km (40 mi) into the atmosphere. 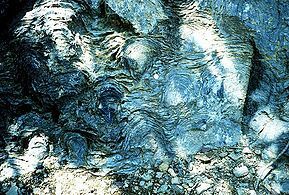 At and below the surface of the earth, the biosphere includes soil, hydrothermal vents, and rock. It includes the deepest parts of the ocean. Under certain test conditions, life forms have been observed to thrive in the near-weightlessness of space and to survive in the vacuum of outer space. Life forms appear to thrive in the Mariana Trench, the deepest spot in the Earth's oceans, reaching a depth of 11,034 m (36,201 ft; 7 mi). Other researchers reported related studies that life forms thrive inside rocks up to 580 m (1,900 ft; 0.36 mi) below the sea floor under 2,590 m (8,500 ft; 1.61 mi) of ocean, off the coast of the northwestern United States, as well as 2,400 m (7,900 ft; 1.5 mi) beneath the seabed off Japan. In August 2014, scientists confirmed the existence of life forms living 800 m (2,600 ft; 0.50 mi) below the ice of Antarctica. In December 2018, researchers announced that considerable amounts of life forms, including 70% of bacteria and archea on Earth, comprising up to 23 billion tonnes of carbon, live at least 4.8 km (3.0 mi) deep underground, including 2.5 km (1.6 mi) below the seabed, according to a ten-year Deep Carbon Observatory project. In 2017, fossilized microorganisms, or microfossils, were announced to have been discovered in hydrothermal vent precipitates in the Nuvvuagittuq Belt of Quebec, Canada that may be as old as 4.28 billion years old, the oldest record of life on Earth, suggesting "an almost instantaneous emergence of life" (in a geological time-scale sense), after ocean formation 4.41 billion years ago, and not long after the formation of the Earth 4.54 billion years ago. Nonetheless, life may have started even earlier, at nearly 4.5 billion years ago, as claimed by some researchers. 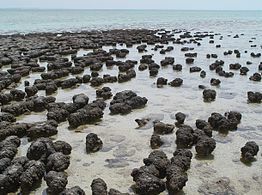 Stromatolites may have been made by microbes moving upward to avoid being smothered by sediment. ^ a b c d e Dodd, Matthew S.; Papineau, Dominic; Grenne, Tor; slack, John F.; Rittner, Martin; Pirajno, Franco; O'Neil, Jonathan; Little, Crispin T. S. (2 March 2017). "Evidence for early life in Earth's oldest hydrothermal vent precipitates" (PDF). Nature. 543 (7643): 60–64. Bibcode:2017Natur.543...60D. doi:10.1038/nature21377. PMID 28252057. ^ a b c Zimmer, Carl (1 March 2017). 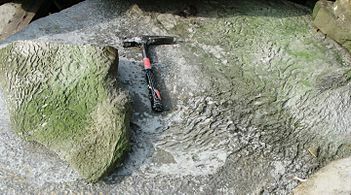 "Scientists Say Canadian Bacteria Fossils May Be Earth's Oldest". New York Times. Retrieved 2 March 2017. ^ a b Staff (20 August 2018). "A timescale for the origin and evolution of all of life on Earth". Phys.org. Retrieved 20 August 2018. ^ a b Betts, Holly C.; Putick, Mark N.; Clark, James W.; Williams, Tom A.; Donoghue, Philip C.J. ; Pisani, Davide (20 August 2018). "Integrated genomic and fossil evidence illuminates life's early evolution and eukaryote origin". Nature. 2 (10): 1556–1562. doi:10.1038/s41559-018-0644-x. PMC 6152910. PMID 30127539. ^ a b Ghosh, Pallab (1 March 2017). "Earliest evidence of life on Earth 'found". BBC News. Retrieved 2 March 2017. ^ a b Dunham, Will (1 March 2017). "Canadian bacteria-like fossils called oldest evidence of life". Reuters. Retrieved 1 March 2017. ^ a b Tyrell, Kelly April (18 December 2017). "Oldest fossils ever found show life on Earth began before 3.5 billion years ago". University of Wisconsin–Madison. Retrieved 18 December 2017. ^ a b Schopf, J. William; Kitajima, Kouki; Spicuzza, Michael J.; Kudryavtsev, Anatolly B.; Valley, John W. (2017). "SIMS analyses of the oldest known assemblage of microfossils document their taxon-correlated carbon isotope compositions". PNAS. 115 (1): 53–58. Bibcode:2018PNAS..115...53S. doi:10.1073/pnas.1718063115. PMC 5776830. PMID 29255053. ^ "life form". World English Dictionary. Dictionary.com. 2009. ^ "life form". Online Oxford Dictionary of English. Oxford University Press. 2005. ^ Graham, Robert W. (February 1990). "Extraterrestrial Life in the Universe" (PDF) (NASA Technical Memorandum 102363). Lewis Research Center, Cleveland, Ohio: NASA. Retrieved 2 June 2015. ^ Altermann, Wladyslaw (2009). "From Fossils to Astrobiology – A Roadmap to Fata Morgana?". In Seckbach, Joseph; Walsh, Maud (eds.). From Fossils to Astrobiology: Records of Life on Earth and the Search for Extraterrestrial Biosignatures. Cellular Origin, Life in Extreme Habitats and Astrobiology. 12. Dordrecht, the Netherlands; London: Springer Science+Business Media. p. xvii. ISBN 978-1-4020-8836-0. LCCN 2008933212. ^ Novacek, Michael J. (8 November 2014). "Prehistory's Brilliant Future". New York Times. Retrieved 25 December 2014. ^ G. Miller; Scott Spoolman (2012). Environmental Science - Biodiversity Is a Crucial Part of the Earth's Natural Capital. Cengage Learning. p. 62. ISBN 978-1-133-70787-5. Retrieved 27 December 2014. ^ University of Georgia (25 August 1998). "First-Ever Scientific Estimate Of Total Bacteria On Earth Shows Far Greater Numbers Than Ever Known Before". Science Daily. Retrieved 10 November 2014. ^ Deep Carbon Observatory (10 December 2018). "Life in deep Earth totals 15 to 23 billion tons of carbon – hundreds of times more than humans – Deep Carbon Observatory collaborators, exploring the 'Galapagos of the deep,' add to what's known, unknown, and unknowable about Earth's most pristine ecosystem". EurekAlert!. Retrieved 11 December 2018. ^ Dockrill, Peter (11 December 2018). "Scientists Reveal a Massive Biosphere of Life Hidden Under Earth's Surface". Science Alert. Retrieved 11 December 2018. ^ Gabbatiss, Josh (11 December 2018). "Massive 'deep life' study reveals billions of tonnes of microbes living far beneath Earth's surface". The Independent. Retrieved 11 December 2018. ^ Klein, JoAnna (19 December 2018). "Deep Beneath Your Feet, They Live in the Octillions – The real journey to the center of the Earth has begun, and scientists are discovering subsurface microbial beings that shake up what we think we know about life". The New York Times. Retrieved 21 December 2018. ^ "Age of the Earth". United States Geological Survey. 9 July 2007. Retrieved 2006-01-10. ^ Schopf, J. William; Kudryavtsev, Anatoliy B.; Czaja, Andrew D.; Tripathi, Abhishek B. (5 October 2007). "Evidence of Archean life: Stromatolites and microfossils". Precambrian Research. 158 (3–4): 141–155. Bibcode:2007PreR..158..141S. doi:10.1016/j.precamres.2007.04.009. ISSN 0301-9268. ^ Schopf, J. William (29 June 2006). "Fossil evidence of Archaean life". Philosophical Transactions of the Royal Society B. 361 (1470): 869–885. doi:10.1098/rstb.2006.1834. ISSN 0962-8436. PMC 1578735. PMID 16754604. ^ Raven, Peter H.; Johnson, George B. (2002). Biology (6th ed.). Boston, MA: McGraw-Hill. p. 68. ISBN 978-0-07-112261-0. LCCN 2001030052. OCLC 45806501. ^ a b Borenstein, Seth (19 October 2015). "Hints of life on what was thought to be desolate early Earth". Associated Press. Retrieved 9 October 2018. ^ Ohtomo, Yoko; Kakegawa, Takeshi; Ishida, Akizumi; et al. (January 2014). "Evidence for biogenic graphite in early Archaean Isua metasedimentary rocks". Nature Geoscience. 7 (1): 25–28. Bibcode:2014NatGe...7...25O. doi:10.1038/ngeo2025. ISSN 1752-0894. ^ Wade, Nicholas (31 August 2016). "World's Oldest Fossils Found in Greenland". New York Times. Retrieved 31 August 2016. ^ a b Allwood, Abigail C. (22 September 2016). "Evidence of life in Earth's oldest rocks". Nature. 537 (7621): 500–5021. doi:10.1038/nature19429. PMID 27580031. ^ a b Wei-Haas, Maya (17 October 2018). "'World's oldest fossils' may just be pretty rocks – Analysis of 3.7-billion-year-old outcrops has reignited controversy over when life on Earth began". National Geographic. Retrieved 19 October 2018. ^ Djokic, Tara; Van Kranendonk, Martin J.; Campbell, Kathleen A.; Walter, Malcolm R.; Ward, Colin R. (9 May 2017). "Earliest signs of life on land preserved in ca. 3.5 Ga hot spring deposits". Nature Communications. 8: 15263. Bibcode:2017NatCo...815263D. doi:10.1038/ncomms15263. PMC 5436104. PMID 28486437. ^ Borenstein, Seth (13 November 2013). "Oldest fossil found: Meet your microbial mom". Excite. Yonkers, NY: Mindspark Interactive Network. Associated Press. Retrieved 2 June 2015. ^ Pearlman, Jonathan (13 November 2013). "'Oldest signs of life on Earth found'". The Daily Telegraph. London: Telegraph Media Group. Retrieved 2014-12-15. ^ Noffke, Nora; Christian, Daniel; Wacey, David; Hazen, Robert M. (16 November 2013). 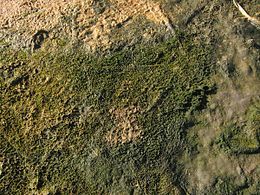 "Microbially Induced Sedimentary Structures Recording an Ancient Ecosystem in the ca. 3.48 Billion-Year-Old Dresser Formation, Pilbara, Western Australia". Astrobiology. 13 (12): 1103–1124. Bibcode:2013AsBio..13.1103N. doi:10.1089/ast.2013.1030. ISSN 1531-1074. PMC 3870916. PMID 24205812. ^ Staff, Lawrence Berkeley National laboratory (10 January 2018). "Ingredients for life revealed in meteorites that fell to Earth - Study, based in part at Berkeley Lab, also suggests dwarf planet in asteroid belt may be a source of rich organic matter". AAAS – EurekAlert. Retrieved 11 January 2018. ^ Schouten, Lucy (20 October 2015). "When did life first emerge on Earth? Maybe a lot earlier than we thought". The Christian Science Monitor. Boston, Massachusetts: Christian Science Publishing Society. ISSN 0882-7729. Archived from the original on 22 March 2016. Retrieved 9 October 2018. ^ Johnston, Ian (2 October 2017). "Life first emerged in 'warm little ponds' almost as old as the Earth itself - Charles Darwin's famous idea backed by new scientific study". The Independent. Retrieved 2 October 2017. ^ Porada H.; Ghergut J.; Bouougri El H. (2008). "Kinneyia-Type Wrinkle Structures—Critical Review And Model Of Formation". PALAIOS. 23 (2): 65–77. doi:10.2110/palo.2006.p06-095r.